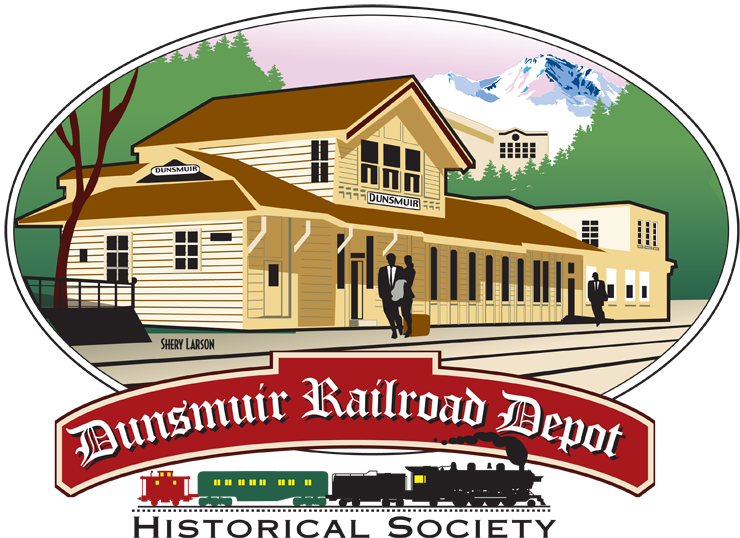 The Dunsmuir Railroad Depot Historical Society has a new President. Anthony (Tony) Skalko has assumed the duties from Rita Green, who has served in that capacity since December 2002. Many thanks to Rita for her many good works on behalf of the Depot Society and Dunsmuir! Tony attended one of the very first meetings to save the Dunsmuir AMTRAK Depot. He has long been interested in trains and Dunsmuir’s railroad history. We are pleased to announce that the Depot Society has a website, www.dunsmuirdepot.com, featuring the latest information about the Depot Society, its newsletter and events. This past June, Rita attended the Amtrak Great American Stations Project meeting in Portland. 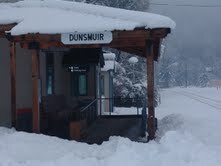 Her presentation noted that Dunsmuir is a historic railroad town. “Our Depot Society has renovated the waiting room and added a Railroad Display Room to honor our railroad roots. We are very proud of our unique Amtrak station.” Amtrak has advised they have set-up a remodel schedule for our Depot, with the finished design scheduled for July 2014. The Depot’s drinking fountain has been installed, and the Annex building used for storage has been painted. The Railroad Display Room and the work-in-progress Dunsmuir Museum is open the third Saturday of each month and for town events. They will be closed for the winter months of November through March 2014. However, you just may find the Depot President working down there if you want to take a peek. The May National Train Day celebrated at the Amtrak Depot had 68 people visiting with many children present. An exhibit of 30’s, 40’s and 50’s Train travel advertisements were displayed. People were encouraged to take the train. Our 5th Annual Pie Social during Dunsmuir Dogwood Daze was another success. Seventy-three bakers donated 49 kinds of 172 pies. Thanks to our bakers, bakery helpers and set-up crew. Railroad Days. We were open Friday afternoon and Saturday and had 184 visitors. October Art Walk. The Railroad Display Room and the Museum were open for the town event. Free Amtrak hats for children and refreshments were served. A local artist, Joe Vella, was featured. We greeted over 200 visitors. DUNSMUIR MUSEUM – The exhibit showing how the coming of the diesel locomotive affected the economy of Dunsmuir was completed. The RAILROAD DAYS display case has been completed showing RR Days buttons and programs. We are still missing the following Railroad Days buttons: 1961, 66, 67, 68, 69, 70, 71, 73, 74, 94, 96, 97, 98, 99, 2000, and 2013. Please let us know if you have these years and if you would like to add them to our collection. The Railroad Display Room and adjacent room will be refurbished during the winter months. The Shasta Division Archives folks continue to file documents into relevant files, photographs, maintenance of way standards, etc. Research was conducted for the Hanlon, Deetz, Sulloway and Sullivan families as well as two other requests. 2014 EVENTS — Mark your calendars!!!!! 12th Annual Soup and Song Fundraiser for RR Days – Donate your favorite soup! 24th 6th Annual Pie Social – Start collecting recipes for your contribution! MEMBERSHIP. Dues are due. Your $10 Depot membership check and your $10 Museum membership check may be sent to the Depot Society, P O Box 324, Dunsmuir CA 96025. All donations are welcome. Should you wish to receive your Depot newsletter electronically, please send us a note with your email address. We look forward to our Museum’s GRAND OPENING on May 3, 2014 and encourage folks to volunteer to serve as Museum docents. We would like to see our Museum open every Saturday. Please contact me (via Contact, email, mail or phone) to volunteer as a docent. Your continued support of the Society is greatly appreciated.